MENLO PARK, Calif., April 5, 2018 /PRNewswire/ -- The tenure tide is shifting, and substantially more workers — especially those from younger generations — see rewards in job hopping than before, according to new research from global staffing firm Robert Half. Sixty-four percent of professionals polled think changing roles every few years can be beneficial, with the biggest perk being a higher salary. This marks a 22 percent increase from a similar survey conducted four years ago. Executives don't necessarily agree. A separate survey of CFOs found 44 percent are not at all likely to hire a candidate with a history of job hopping because they want to avoid losing them in the future. But workers and managers are close to agreeing on one thing: When asked the number of role changes in 10 years that constitute a job hopper, professionals said five and CFOs cited six. 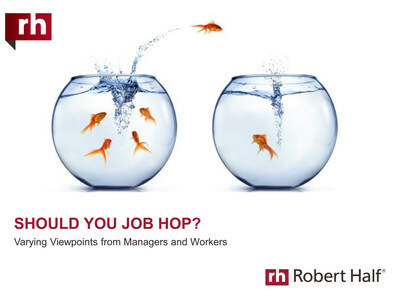 View a slideshow to see how workers and executives view job hopping. Seventy-five percent of employees ages 18 to 34 view job hopping as beneficial, compared to 59 percent of workers ages 35 to 54 and 51 percent of those 55 and older. Workers with a college degree or higher see the most benefit in changing jobs every few years (67 percent). Company size matters: 51 percent of CFOs at companies with more than 1,000 employees said a history of frequent job changes isn't relevant if the candidate is the right fit. The biggest drawback of job hopping, cited by 46 percent of workers, is being perceived as a flight risk. "While job hopping can have benefits, too many employment changes can raise red flags with hiring managers," said Paul McDonald, senior executive director for Robert Half. "Professionals should take time to weigh the pros and cons before making a career move." Companies struggling with employee turnover need to make retention a priority. Added McDonald, "In today's candidate-short market, keeping key performers engaged should be top of mind for managers. Businesses worried about losing talent to the competition should focus on improving corporate culture and strive to be the type of company employees want to stay with long term." Make your company a great place to work. Promote your organization's reputation and values to attract candidates who have similar principles. Highlight advantages, such as a positive corporate culture and flexible scheduling options, that make employees feel respected and excited to come to work. Invest in employees' growth. Offering professional development opportunities can increase job satisfaction of existing staff and attract in-demand candidates. The surveys were developed by Robert Half and conducted by independent research firms. The survey of workers includes responses from more than 1,000 U.S. workers 18 years of age or older and employed in office environments. The CFO survey is based on telephone interviews with more than 2,200 CFOs from a stratified random sample of companies in more than 20 of the largest U.S. metropolitan areas.